The Rains are Coming; The Turkey Vultures and California Sisters are Leaving. The Weather Channel was clear in its forecast: A monster weather pattern would soon be arriving in the Pacific Northwest, dumping several inches of rain onto our drought-ridden lands and whipping the landscape with winds gusting as high as 100 mph. Time to batten down the hatches! Knowing that the remnants of typhoon Songda were heading our direction, we made a quick foray into the refuge to see what had been happening since our last outing. 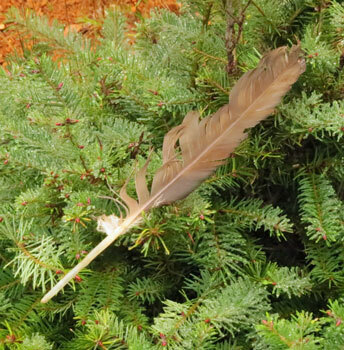 As we approached a young conifer at the beginning of our walk, we spied a fallen turkey vulture feather clinging to its young, tender branches. Later, a California Sister darted gracefully from one side of the path to the other and eventually skyward through an opening in the oak trees, most assuredly not to be viewed again until next spring. dwarfed by deer nibbling on its new growth. Not too surprisingly, there were no edible fungi to be found; the short rains we'd experienced lately had not brought sufficient moisture to awaken the ground. 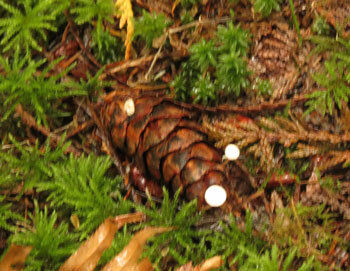 Still, the forest floor was alive; it was as if every pine cone was host to a fruiting of the seemingly inconsequential Strobilurus trullisatus. Their whitish caps were simply carpeting every surface and creating a lovely panorama. The ancient, long buried mycelia have come back to the light, stimulated by the fall rains, and have pushed their fruits up through the forest floor, providing food for people and critters alike. Many organizations in Oregon, Washington and Northern California are taking advantage of this annual fruiting and have scheduled fungi festivals. Here's a listing of the ones that we've been able to locate. Before heading to the event, be sure to check their website or call the contact number listed on the website to confirm that the information supplied to us is still current. Sometimes, when you least expect it, something truly remarkable happens - Kismet - and so it was for me this past Sunday. There's Magic in Them Thar Hills! What do you do when the rains haven't come to Port Orford? Well, we head for the hills, or in this case, Mt. Hood, and traverse a route that will take us from Magic Tree to Magic Hill to Matsutakeville and finally to Magic Trail. Friday we awoke to an overcast, somewhat drizzly day at our tiny cabin which nests among Douglas Fir, Western Red Cedars and Cottonwoods in Brightwood, a small town that is merely a dip in the road between Sandy and Wemme just off of Highway 26. We pulled back the curtains and rejoiced in the dampness blanketing the mountain. Surely this was an indicator of good things to come. We put on our happy faces, gathered the tools of our trade (baskets, guidebooks, knives, notebooks, whistles and compasses) and packed lunch in a brown paper bag for a picnic near the historic Clackamas Lake Ranger Station. Magic Tree, as usual, was our first stop and did not disappoint. At 3,000 feet the ground was moister than at our cabin, and the air was definitely cooler. There was a crispness in the air, and the autumn leaves hopscotched down the side road as we approached our destination. Several handfuls of Wooly Chanterelles greeted us as we navigated the dense brush and seemed to guide us to where White Chanterelles were hiding just below the duff. Dirty, yes, they were, but the soil was easily removed from the White Chanterelles back at the cabin later in the day, and it was well worth the effort. 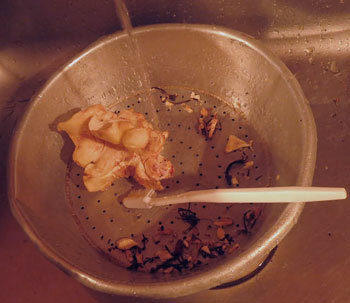 in a colander keeps the debris from going down the drain. 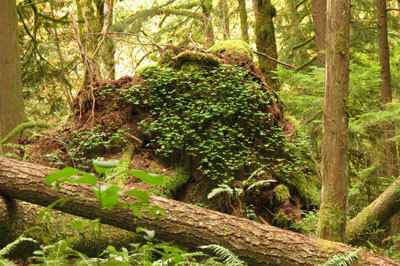 What do Spawning Salmon, Mushrooms, Bigfoot and Adventure Have in Common? The salmon have been spawning in Still Creek and other streams on Mt Hood, and we had to go take a look for ourselves this past Saturday. Seems we never tire of witnessing this ritual of life and death. The spawning spectacle was nearing its final days, but we found a couple of great observation points that we'd like to share with you. For example, the Wildwood Recreation Site is a good viewing spot, although we have a personal objection to having to pay a fee to enter these public grounds, and never go there ourselves. We well remember this area when it was simply a nice picnic area - and free. Instead, we chose the bridge on the 32 Road which had been closed to vehicle traffic by the Forest Service in 2013 (See note below). Gazing down into the waters we were awed by about a dozen large salmon swimming, swirling, splashing, spawning directly below us. Returning to Highway 26, we found ourselves turning into Mt. Hood Village Resort, enticed by signs directing us to the 25th Annual Mt. Hood Festival of Salmon, Mushrooms and Bigfoot. This casual event sponsored by the Cascade Geographic Society offered attendees free admission and parking, a salmon bake, wild mushroom identification by members of the Oregon Mycological Society (OMS), folk music, craft tables, huckleberry tasting, and much more. someone was dining on a mushroom in the nearby woods. Here on the south coast, we call Craterellus tubaeformis: "Yellow Foot." They can be a little hard to find, that is until you find that sweet spot where they grow in abundance. In the refuge, they're frequently popping up in November/December or even into the January/February time period, depending on the weather. Often we observe that they are fruiting in partnership with hedgehogs under second growth tan oaks. Sadly, the Yellow Foot typically gets no respect, and is generally ignored by many mushroom collectors. Gourmands tend to dismiss it, saying that its flesh is not substantial and its taste is undistinguished. 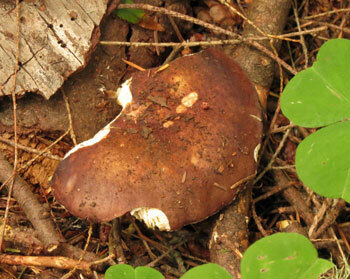 But they haven't experienced this month's recipe, Finnish Funnel Chanterelle Pie. The Arctic Flavours Association, which is supported by the Finnish Ministry of Agriculture of Forestry, has an excellent write up about Yellow Foot mushroom (which they call the Trumpet Chanterelle) in Finland on its website where it describes the Yellow Foot mushrooms as common in the southern and central parts of Finland, growing in mossy woods, typically in large groups in spruce stands but also in mixed forests. 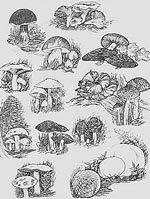 The Association recommends either drying or freezing the mushroom as a preservation technique, but also suggests pickling them. 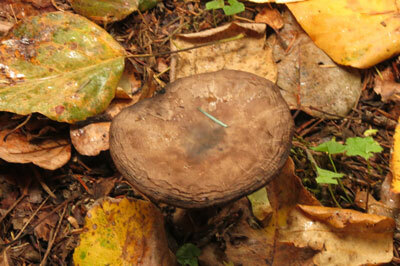 Why bother with a thin fleshed mushroom such as this? The Association concludes that they “are rich in vitamin D. Eating them in the winter is a natural way to increase one’s vitamin D intake.” To which we would add that in the right recipe, they're yummy! But set all that aside. For it really doesn't matter where you find Yellow Foot mushrooms or what you call them or how they are reviewed by foodies ... when they are featured in this month's Incredible Edible, they're guaranteed to be the star of your dinner table.